*BUILT FALL 2018*! 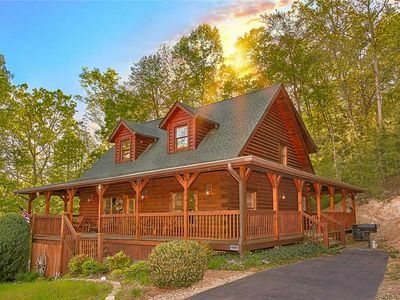 Spacious 5 bdrm, 3.5 ba custom log cabin. Mountain and ridge view. Great for families. 2 king master suites. Sleeps up to 16 (4 being kids under 14 or small adults who can sleep in short twin bunks). 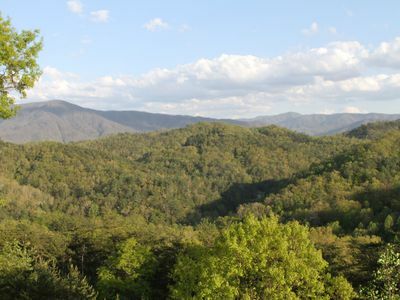 Easy access to Gatlinburg & Pigeon Forge, near Arts and Crafts loop, and the Great Smoky Mountains in Tennessee. BY OWNER. 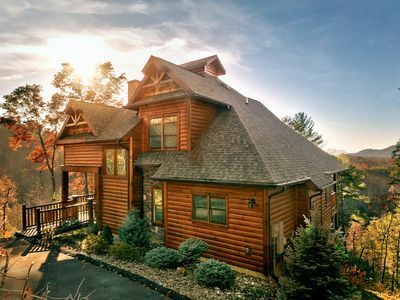 If you are looking for spacious, unique, out-of-the-ordinary luxury mountain cabin in the Smokies, you just found it! 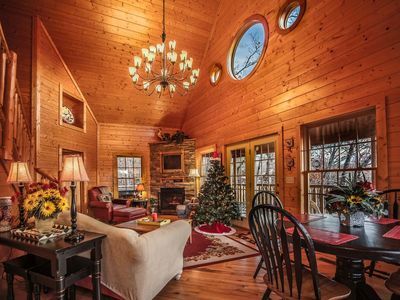 Bring family and friends, have couples retreat or even a family reunion - this 5-bedroom luxury mountain home is sure to please. 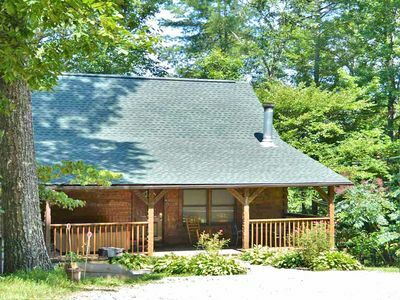 Ridge View lodge was custom built to offer abundant common spaces and yet plenty of separation so that several families or couples can have privacy yet still share the amenities. Starting with the main floor great room you will find soaring timber frame ceilings that are sure to impress. Gather around the huge farm-style dining table handcrafted from rough sawn cedar and enjoy the mountain ridge views through the wall of windows. The front “prow” of the cabin was designed to maximize the view and on a clear day you can see Mt. LeConte at a distance. Comfy leather sofas are great for watching a movie on UHD TV, or just to enjoy a conversation or play a game by the warmth of the fireplace. 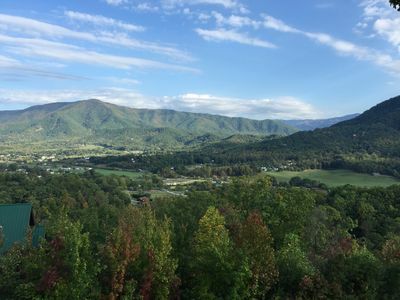 Go for a day of hiking, mountain biking or for the more adventurous try zip-lining at the nearby Climb Works zip-line tours. 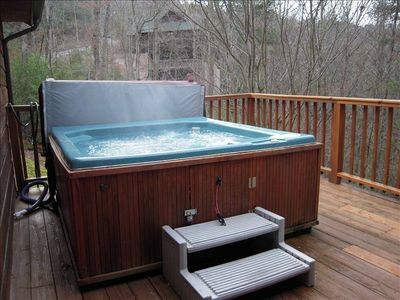 Come back and soothe your sore muscles in our six person hot tub. Relax in style on the oversized deck in our comfortable rockers while the kids stay entertained with the pool table, Foosball and cocktail-style arcade game. Every bedroom is equipped with a TV with Satellite TV. 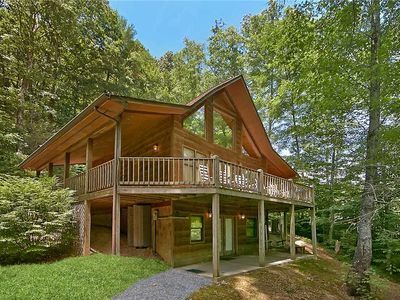 Sit out on covered side porches and you will feel like you are in a treehouse because cabin is set atop of the hill with a commanding view of the mountain ridges and wooded surroundings. ~ Unique rustic and reclaimed wood furniture, decor items and barn doors handmade by the owners! If star gazing with a glass of wine is your thing - we’ve got a large deck with rockers for that. 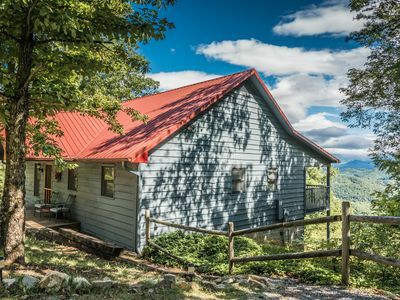 Sit out on covered side porches and you will feel like you are in a treehouse because cabin is set on a hill with a commanding view of the mountain ridges and wooded surroundings. Movies or watching TV are your thing? There are TVs in every room of the house, several with Blu-Ray players and game ports. Love games? We’ve got that too – from cocktail-style 2-player arcade with all the favorite 80s classic games (Packman and Centipede anyone? ), to pool table and Foosball, we’ve got you covered! 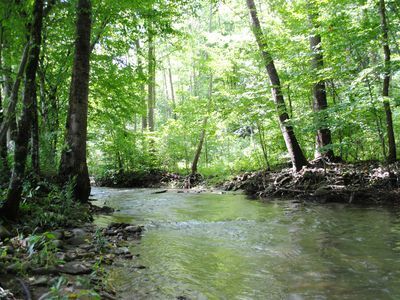 Moms and Dads can relax – youngsters will find plenty to keep them occupied. Starting with the main floor great room you will find soaring timber frame ceilings that are sure to impress. Gather around the huge farm-style dining table handcrafted from rough sawn cedar and enjoy the mountain ridge views through the wall of windows. The front “prow” of the cabin was designed to maximize the view and on a clear day you can see Mt. LeConte at a distance. Comfy leather sofas are great for watching a movie on UHD TV, or just to enjoy a conversation or play a game by the warmth of the fireplace. Open-concept kitchen with tall soft-close cabinetry, granite countertops, stainless appliances and an island clad in reclaimed wood blends modern convenience with a rustic touch. The island seats four and is a great compliment to the adjacent dining area that seats 12. Whether you want to cook your feast from scratch or just microwave-and-go, you will find everything you need. 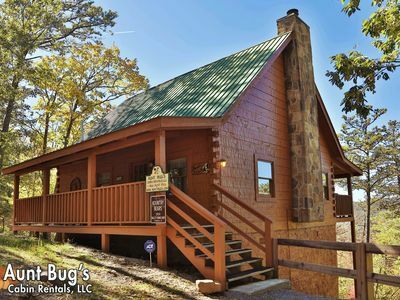 Main floor king master features skip-planed pine log bed with comfy memory foam mattress, and master closet. Large private bath has a separate shower and a jetted tub. We cannot help but mention reclaimed wood vanity (hand crafted by owners!) with two vessel sinks and unique counter-top decorated with fall leaves gathered on the property. Rustic barn door to the bathroom adds character and texture. Heated bathroom floors (in the winter) feel oh-so-good! 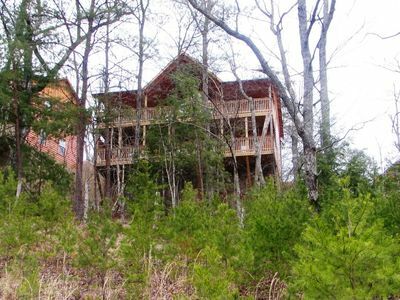 Enter the upper level, and you will be in the loft overlooking the mountain ridge. There you find a 7’ pool table made by a local craftsman with reclaimed beams. Enjoy a beverage sitting down at a reclaimed wood pub table accented by Mason jar lights, and watch others play... or just gaze through the picture window at the beautiful mountain surroundings. 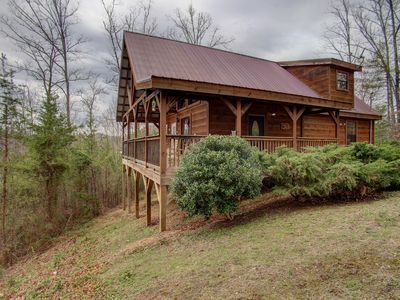 The upper level has a king bedroom that showcases rustic charm with its live edge cypress headboard, “Ole Smoky Moonshine” mason jar night lights, barn-style closet door handmade by the owners and a restored antique dresser. The upper level queen bedroom is furnished with rustic aspen log bed, cushy memory foam mattress plus a twin daybed – a retreat that can accommodate a small family. Upper level bathroom features a walk-in shower and a reclaimed wood double vanity, also lovingly hand crafted by the owners. Heated floors in winter add a touch of welcome warmth. 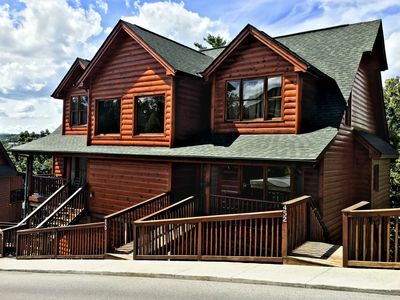 The lower level of Ridge View Lodge features family/media room with a 70” 4K UHD TV, 2-player arcade, and foosball table plus comfy sectional seating and gas log fireplace for those cool nights. 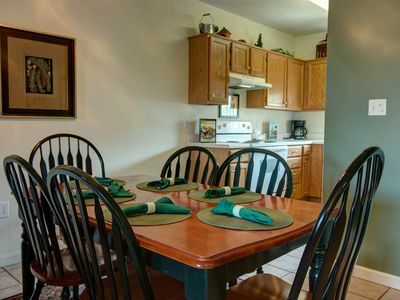 Adjacent kitchenette has a full-size refrigerator, sink, and microwave for our guest’s convenience – be it popcorn, glass of water or a late-night snack. Down the hallway from the media room there is a queen bedroom and a bunk-room with two twin-over-twin log bunk beds. The queen bedroom is furnished with rustic log bed, comfy memory foam mattress plus a twin daybed – a retreat that can accommodate a small family. In addition to a TV in the bunk-room, there is a game port and Blu-ray player to entertain the younger guests. Spacious bathroom with reclaimed wood hand crafted double vanity, tub and of course, heated floors (winter) rounds out the lower level space. Outdoor spaces at Ridge View Lodge are just as guest-friendly. The side yard has enough room to play. At the very back there is a stacked stone firepit with ample seating overlooking the view. Relax by the fire pit, roast marshmallows or just watch the dancing fire under the stars. Charcoal grill and picnic tables on a patio make your cook outs a breeze. 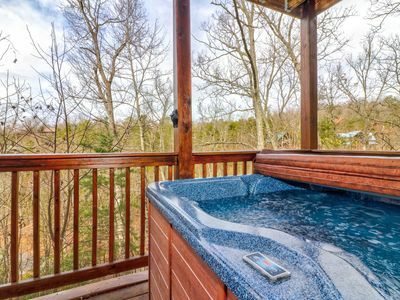 A 6-person hot tub on the patio is there for you to relax your tired muscles after a day of exploring all that Great Smoky Mountains have to offer. Since sound carries so far in the mountains, please be respectful of others and keep noise levels down when enjoying amenities outside after 10PM. We hope that you will make wonderful memories staying at Ridge View Lodge and treat it with care and respect that this unique mountain cabin deserves! Logcabinlivingalltheway in this fantabulous cabin! 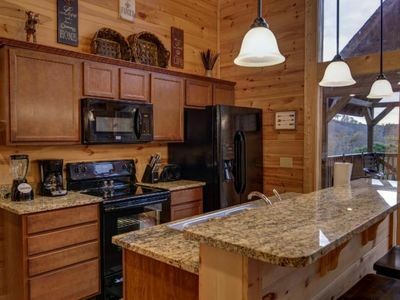 Like and follow @TN.RidgeViewLodge ! MUST be 25 or older to book, sign Rental agreement & provide valid photo ID within 72 hrs of booking. 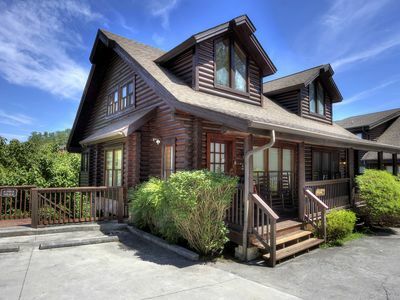 Also see Blue Mountain Lodge (4 bd/ 4.5 ba) #737717 - a sister property to Ridge View Lodge - on the same street (can be rented together based on availability). 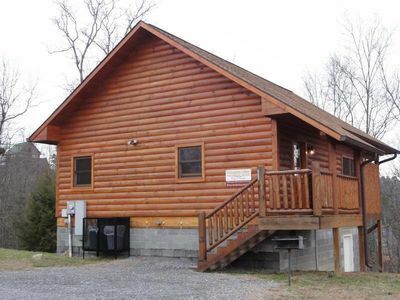 Also see our 3 bd/2 ba log cabin "Appalachian Escape" #629999. HEAVENLY DAZE; The name says it all! 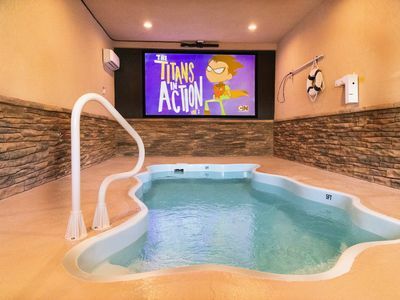 Cinematic Splash: Smoky Mtn POOL cabin with THEATER ROOM!